At our house we make a meal plan, grocery shop, and prepare and cook “most” of our own food. I thought I would show you what that looked like for a week. I’m doing it in retrospect (like Economies of Kale) so I can report what I actually did, versus what I said I’d do! 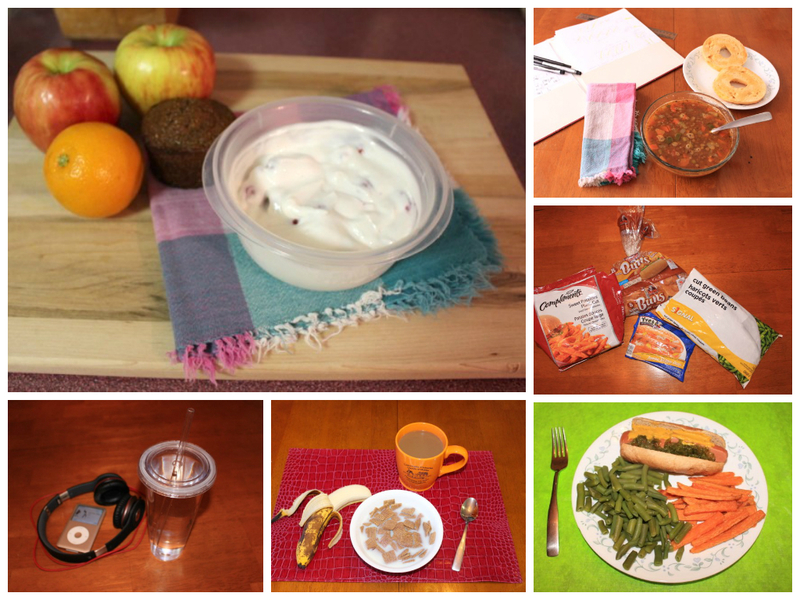 We are usually a bit lazy about getting started on a meal plan at the beginning of each month, but February 1 was no worse than usual. Lunch – Out to an English-style café which had all-day breakfast! Dinner – Stir fry. No cashews or peanuts, so used sunflower seeds which oddly blended right in with the brown rice! Tried to make own teriyaki sauce from an Internet recipe with little success. It was edible. On weekdays, Rom takes a packed lunch to work. I bring lots of snacks, and come home for lunch. This week, I made a curry and Rom made a lentil stew. Both recipes were supposed to make 4 servings but they each made six, so we didn’t have to cook again all week. I worked one evening shift to 9 pm, so Rom fended for himself for dinner. He attended a work function another night so I did the same. 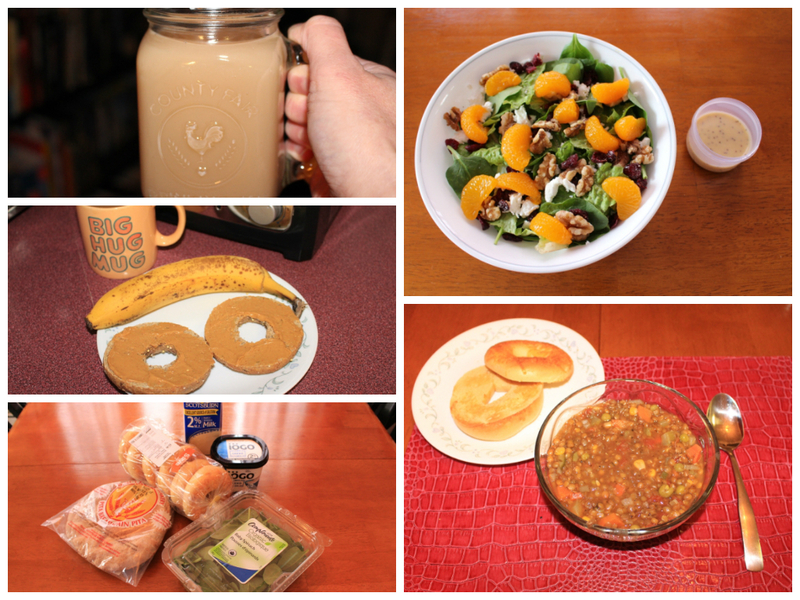 Fri Feb 7 (clockwise from top left): the usual work snacks, lentil stew and cheese bagel for a working lunch, ingredients for dinner (Rom was out so I had all packaged food), dinner of veggie hot dog, sweet potato fries and green beans, Shreddies for breakfast and using up the bananas, and (believe it or not) water again! I was trying an experiment this week. In December, I was eating candy daily and extending the festive season. In January, I decided I would snack as much as I liked, but no candy. So I had unlimited amounts of nuts, raisins, popcorn, and some crackers and cereal. This week I tried out having no snacks after dinner. Since our main meal is at 7 pm, this isn’t so bad, and I will stick with it for a while. Well, maybe the occasion dessert and some weekend popcorn! Do you make meal plans? What is your tolerance for eating leftovers? 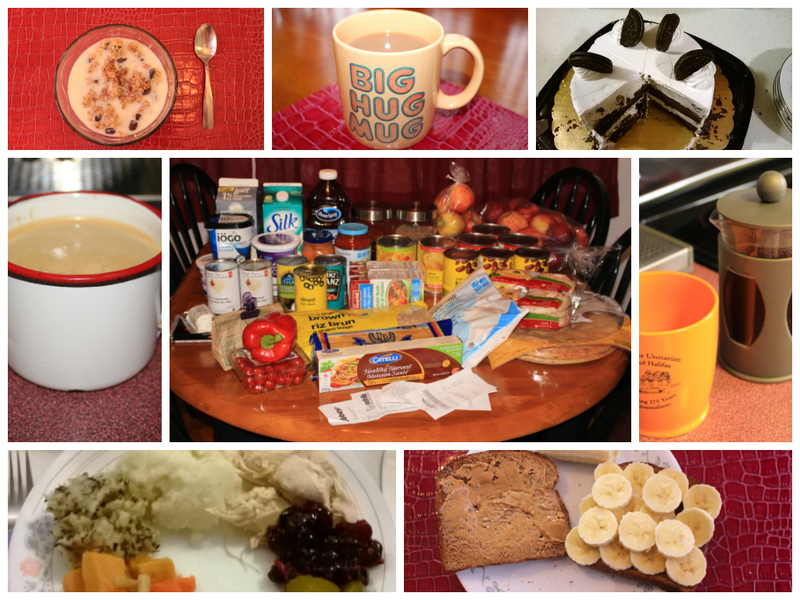 PS – My nutrition program tells me I averaged 2100 calories a day this week. I love seeing what a “vegetarian” week looks like; it makes it so much easier to try to envisage (for life-long meat-eaters like us.) My biggest first reaction is to marvel at the moderate portion sizes. *Gulp*! I’m pretty sure our meal sizes here are too much for what we really need; but “too much” has become the standard. 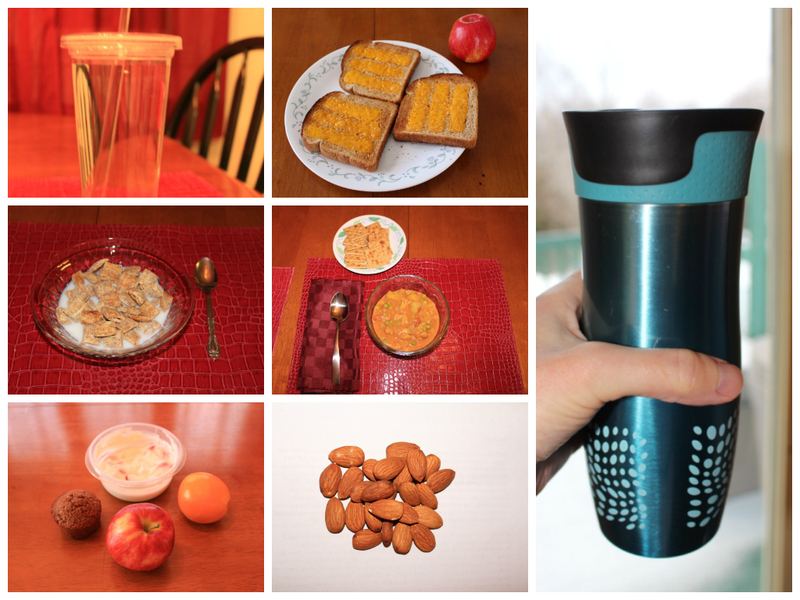 It’s really interesting to see photos of an entire week of meals at a glance. 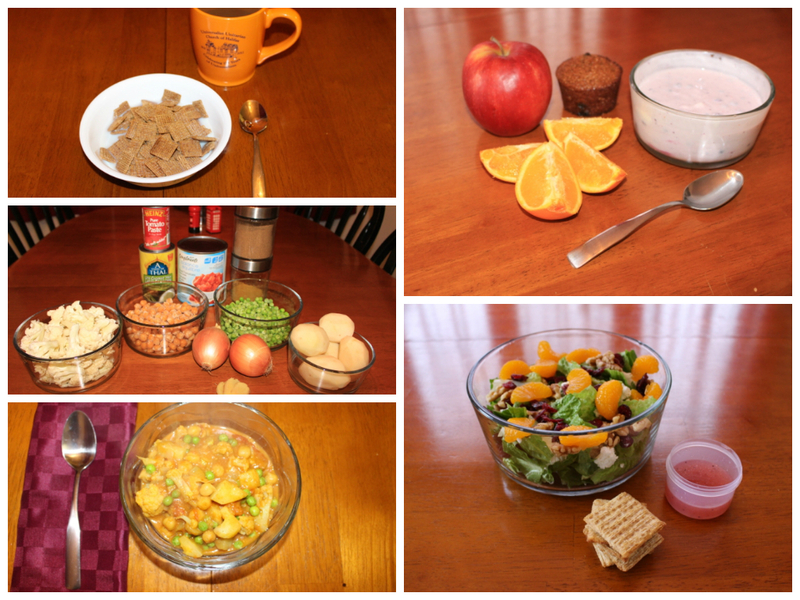 It’s funny you should say that; when I looked at the photos at the end of the week, I realized almost every meal involved a bowl and a spoon, so apparently a proper serving size is “a bowl full”! I used to always eat dinner as a “bowl full” when I lived with girlfriends before I got married (all those years ago.) Then I progressed to a dinner plate along with my much bigger husband. Now I consider a bowl a “snack”…hmmm! It is so unfair that we can’t eat like the larger people in our lives without becoming larger ourselves! I love seeing what you eat so this was a real treat for me. I’m in London this week and eating richer foods caught up with me last night! I’ve realized I actually enjoy my simple meals prepared at home. My body is rejecting heavy sauces and fried foods which is probably a good thing! Thanks for sharing Dar. Hi Tina! That happens to me every time I travel. Even eating vegetarian, the menu options are often things like quiche (or anywhere in the UK – some kind of pie!) Hope you’re enjoying your stay! I loved seeing this too! The only main meal we tend to eat as actual leftovers is chili (rice then nachos) – with everything else, curry bolognese etc, I make twice as much and then freeze half. I would rather have the same thing twice than three times in a week! But it’s easier to have more of the same than to cook another meal. I should freeze the remainders, cook another meal, and then eventually I would have a backlog in the freezer which would add more variety. I do my grocery shopping on Saturday and all of my weekly food prep on Sunday. It has worked for me because I no longer have to decide meals all week long. That’s the perfect system, Jodi! I’m with Fiona on seeing the portion sizes. 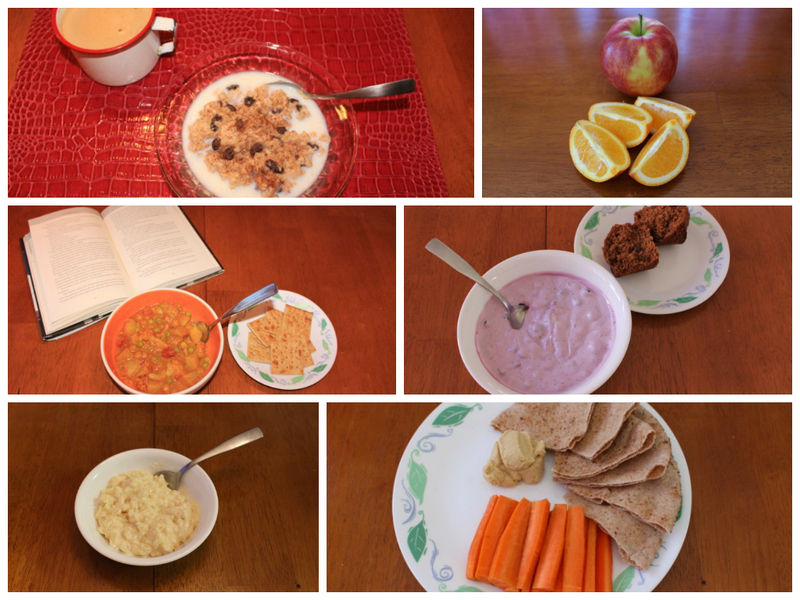 I think it would be good for me to photograph my week of meals so I can see the total amount of food I’ve ingested. I bet it would be an eye-opener! I’ve started to notice more, how I am eating the same portion my husband is eating at dinner and considering our differences in size, I don’t think that is good! Yes, I meal plan for the week ahead on Sunday. I shop on Monday. I like getting at least 2 dinners out of a recipe. My tolerance for leftovers wanes after the 2nd day. Me too, I think I will start freezing extra portions after 2 meals’ worth. There is only 4″ and 30 lbs difference between Rom and I, so we usually have the same meals but he adds bread and desserts, as well as different snacks. Oh well! Diva keeps threatening to become a vegetarian. She is a big meat lover so I can’t see this happening but I hadn’t thought to make more veggie dishes to test it out. I will see about putting together a lentil stew and see what happens. Thanks for the idea. A lot of first-time vegetarians don’t actually like vegetables, lentils and beans, so they fill up on cereal, chips, etc. I know I did the first time around (it only lasted a few days!) Let me know how it goes! Looks like a week of yummy eats! I love ice cream cake 🙂 I also love how many of your meals are in bowls. Mr. G and I always marvel at the fact that we can dirty all our spoons in a day! What kind of veggie dogs do you eat? I haven’t had any luck finding one I like. What a great and detailed post! I love when we can take a peak into other peoples’ lives like this! Thanks, I love seeing other people’s “life details” too! Oh now I’d like to try this too! (Especially seeing I’m cooking a lot of recipes that look awesome – we could compare to ‘real life!’). I should definitely do it, would be interesting to see. Thanks for the link – glad to see some water featured! 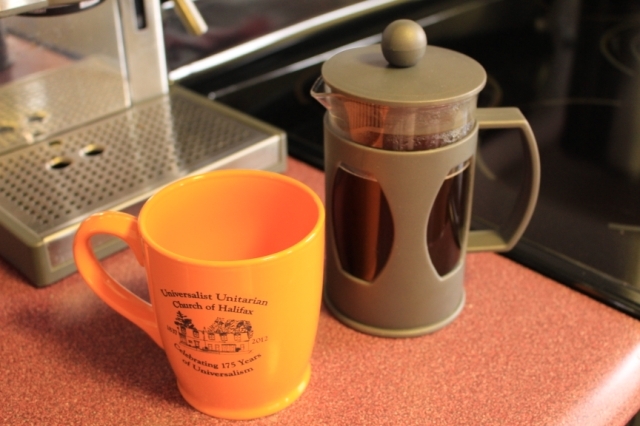 But in the cold, I understand all the coffee and tea! Sarah, that’s amazing – I will be forwarding it to Link! 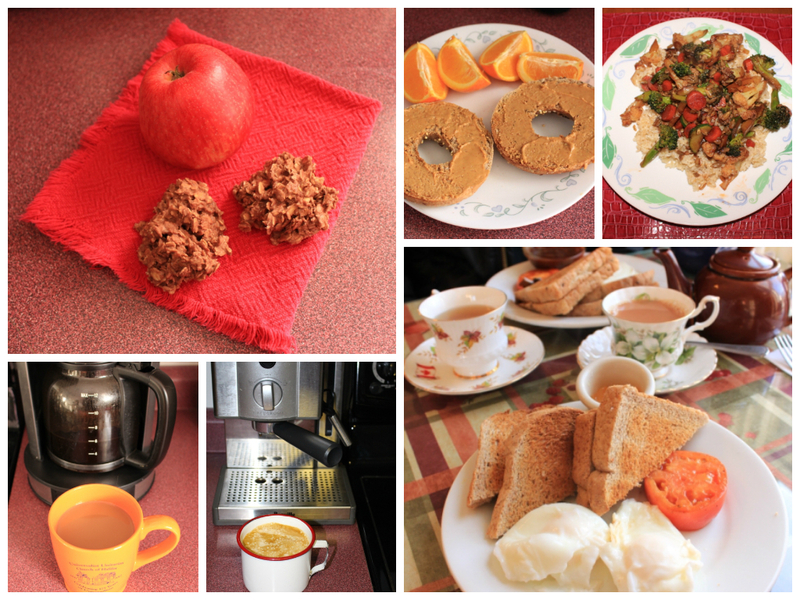 Hi Sarah, I hope the 1200 calories is a temporary thing – I aim for 2200!! Ha ha, you are now the lunch comptroller! It would be fun to see a week of your “eats” too. I don’t menu plan, but we have pretty good stock in our two freezers and pantry, and we live in the middle of nowhere, so eating at home comes naturally to us. Its pretty easy to put something together at any given time. My newest favourite in the grocery store are the time saving bags of premixed salad that contain kale, purple and green cabbage, shredded Brussels sprouts, seeds, dried fruit and a package of dressing. All the different ones that I have tried so far are really good. It’s something new to come to our stores and I have to admit that I love the convenience. I’m not sure I’ve seen those, Heidi. Where do you shop? Hope all is well with you & your family this shivery winter! I just wish it would stop snowing for a day or two. I’ve found the salads at No Frills, Metro (used to be A&P in ON) and Costco. I had never seen them before this December, but now that I have I buy them all the time. Dole makes a few of the kits and there are others that are called “Chop Chop” I think. The kale and the cabbage make them nice flavourful and crispy salads. If there is salad left over, it can be refrigerated afterwards, even with the salad dressing because it doesn’t contain any lettuce that would go soggy. They are found in the same spot as other salad kits or bags of spinach, usually. Thanks! Although I’m fine with leftovers, because we make so many one-dish meals, there is less variety of flavours and it’s harder to recombine foods and make them into a meal that is “somewhat” different. It is going to be exactly the same as the day before!